It’s a rare thing for a kid to actually enjoy doing chores, but if there was ever one that did, this is him. 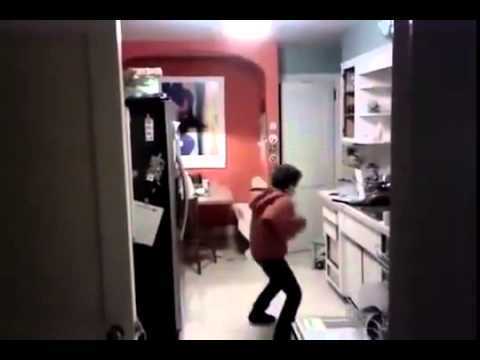 At first it looks like he’s just listening to a little Michael Jackson to get through loading the dishwasher, but all of a sudden he breaks into a sick dance routine that rivals most pop stars’. The best part about this video is that I’m pretty sure it’s being recorded by his dad, who is very careful to keep himself hidden until he can’t stand it anymore. What he ends up capturing, though, is one of those rare, miraculous moments when a kid thinks he’s alone and thus ends up releasing all his inhibitions. In this case, his son is literally dancing like no one’s watching, so when he finally realizes he’s on camera, the look of stunned surprise is priceless. Can we just talk for a second about how awesome this kid is at isolations? I imagine he studied old Michael Jackson music videos night and day to get that good. His leg work is flawless, but I’d love to see him work in a few utensils as props. Hopefully he’ll keep at it, so the next time his dad spies on him, he’ll have a fully choreographed number.